What's the deal with knots? A simple question, no? The answer, however, is a bit of a snarl. Patience, we'll get this untangled soon enough. 1. 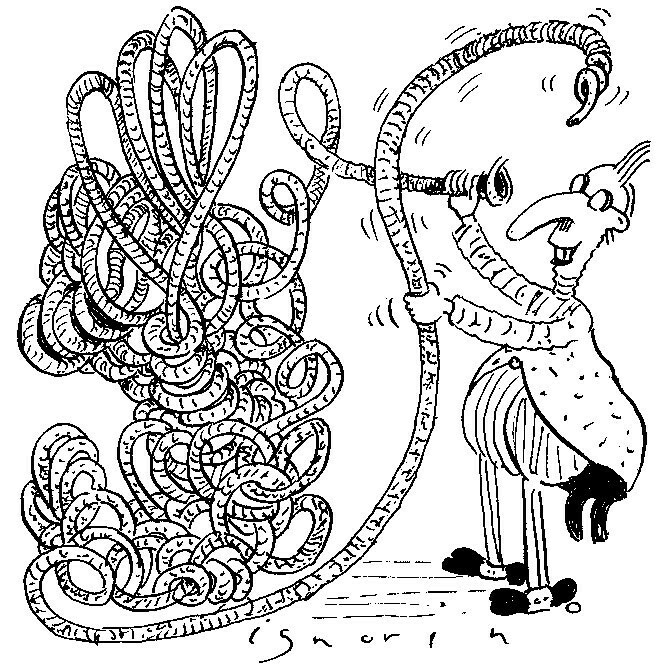 To a scientist or engineer, knots and tangles are of nontrivial interest. The hours you waste untangling necklaces and Christmas lights are the least of it. A knot can reduce a rope's strength by up to 50 percent. A knot in the umbilical cord can result in fetal injury or death. 2. You might suppose mathematics would offer some insight. You'd be wrong. Knot theory, it's true, has been the object of keen interest for more than a century. However, except for a few mavericks, knot theorists have defined their field to exclude all items of practical relevance. The classic mathematical knot is a closed loopthat is, the knot having been tied, the string ends are then joined together, so that the knot may be preserved and studied. 3. In the real world, in contrast, the string ends usually are loose. As one of the aforesaid mavericks puts it, the knots typically form in "a randomly agitated length of free-ended rope." The goal isn't to preserve the knots, but to make them go away, or prevent them from forming in the first place. 4. Recognizing that knot classificationdefining, in rigorous mathematical terms, exactly what kind of mess you've got thereis hardly the top priority of anyone contemplating a snarled extension cord, a few upstarts have taken a stab at investigating knot formation. For example, physicists Dorian Raymer and Douglas Smith, in "Spontaneous Knotting of an Agitated String" (2007), report on a series of experiments in which ropes of varying length were tumbled at varying speeds in boxes of varying size for varying lengths of time. As you'll appreciate, Shonda, this is a fair approximation of the real-world situation you describe. 5. At first glance the results don't seem particularly illuminating: "Complex knots often form within seconds," Raymer and Smith write. In other news, sun rises in east, pope Catholic. 6. On closer examination, things get more interesting: "Above a critical string length, the probability ... of knotting at first increased sharply with length but then saturated below 100 percent." In other words, the longer the string, the more likely it was to get tangled. Butand this is the point of importanceit didn't always get tangled. 7. Key insight: although "numerical studies of confined random walks" (to oversimplify, analyses of the propensity of a simulated randomly-turning string to form knots) suggest the more confined the space, the greater the likelihood of knotting, Raymer and Smith's real-world experiments found the oppositethe smaller the box, the better the odds the string would get wedged against the sides and remain untangled. 8. Enter engineering professor Robert Matthews of Aston University, UK. We at the Straight Dope have had no contact with Bob beyond reading a paper of his we found online called "The Spontaneous Knotting Problem: Are Loops the Answer?" Nonetheless, we state unequivocally: This is our kind of guy. • The longer the string, the closer the odds of tangling get to certaintyin other words, knotting is a fundamental law of the universe. • The shorter the string, the lower the oddsduh, but bear with me. • A simple way of reducing the length of a string is to connect the free ends (i.e., making a loop) while it's in an unknotted, unagitated state, thereby both taking the troublesome ends out of play and effectively cutting the length in half. • Experiments indicate that, for string lengths up to two meters, looping likewise cuts the odds of tangling in half. 10. 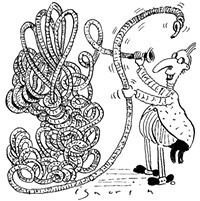 Cynics will now object: any birdbrain knows the way to prevent a rope, cord, etc., from tangling is to coil it and then cinch the coils (or, per Raymer and Smith, put the coiled rope in a small container) before storage. True, but the world is full of birdbrains. If all they learn is to connect the ends before tossing the string in the box (which, in the case of Christmas lights, merely means plugging one end into the other), they'll reduce their problems by ... well, maybe not half. (A string of Christmas lights is typically longer than two meters.) But a lot.